Hi all!! Welcome to another challenge for Lawnscaping!! 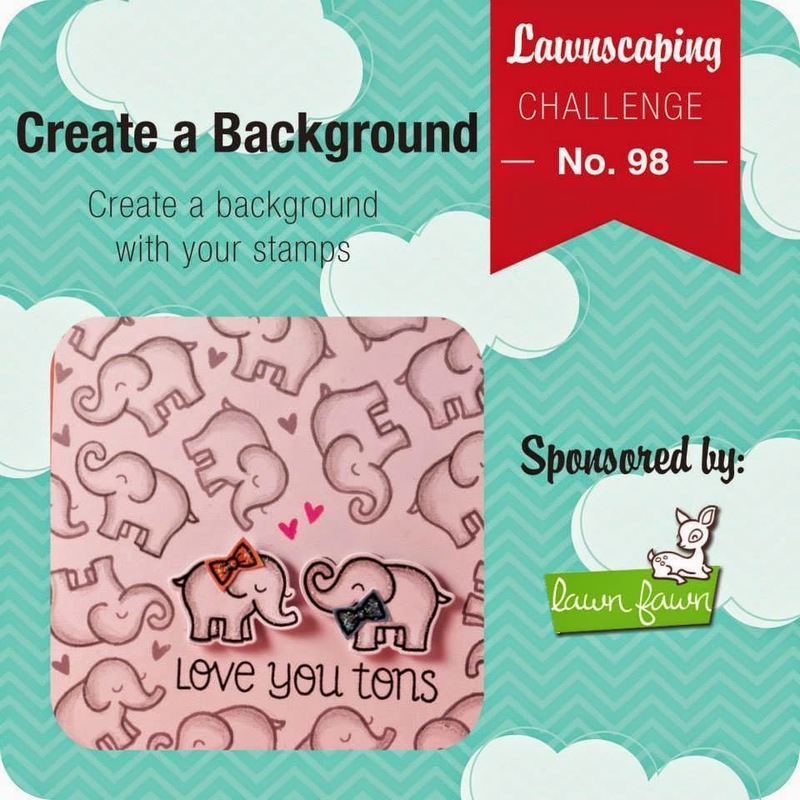 This challenge focuses on creating a background with your stamps. So - its time to look at those stamps a bit differently and stretch them to a new level!! For this challenge our sponsor is the one and only - Lawn Fawn!! Have you seen there upcoming release!! WOW!! Can't wait to get my hands on these fun new goodies! Back to challenge talk!! Here is my card I created! So I wanted to ink this cute set Whale you be mine? And, I wanted to use the coordinating dies. So, I used the sentiment and the little heart in this set to create my background. I inked up the heart in Hero Arts Pale Tomato ink and the sentiment in Soft Vanilla ink. I love this whole color combo! So fun and cheery. 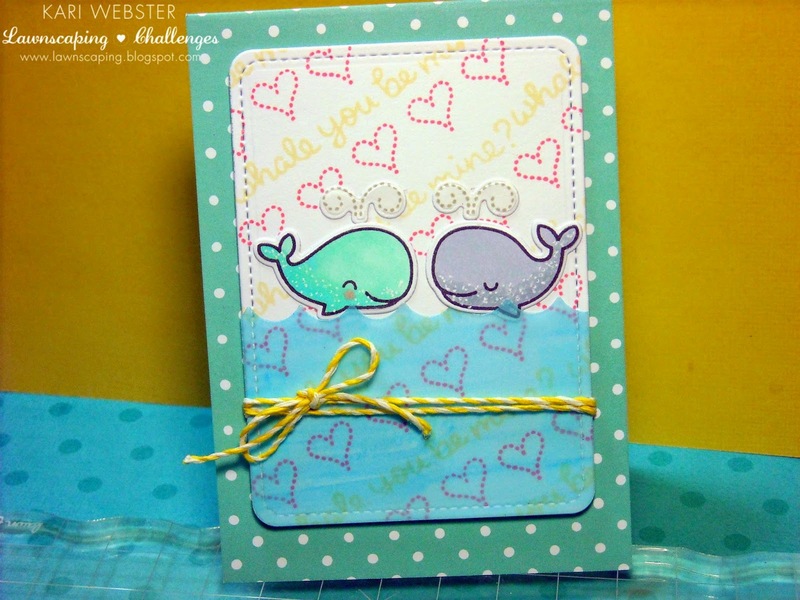 I die cut a piece of white card stock from the Stitched Journaling Card Die, and created my background, and then I stamped my whales, and colored them in with Copics. I also created some water for them out of vellum. I didn't want my stamped background to be covered up too much, that is why I chose vellum. I also used a B02 Copic to color my vellum and I used one of the Stitched Scallop Border Dies and created my waves for my water piece. I adhered all my pieces onto the stamped panel, and added some Lemon Lawn Trimmings. And, my card base is a Mermaid Lawn Fawndamentals note card. So cute! Loved how it turned out. Hope you are able to join us for this new challenge!! Can't wait to see what you all come up with!! See you soon! Your card is so sweet!! Looking forward to play with my stamps!! soooooo adorable!!! love those whales!! they are SO cute! and i love the coloring!! what a whate-y cute card!! ha!! the sentiment as part of the background is genius! !